Pensive – Love. Life. Practice. I’ve been wondering about my obsession with pens lately. One of my favorite moments this trip was walking through the streets of Berlin and discovering a Mont Blanc store. For those who do not know, Mont Blanc pens are ridiculously overpriced examples of great craftsmanship and a pleasure to write with. 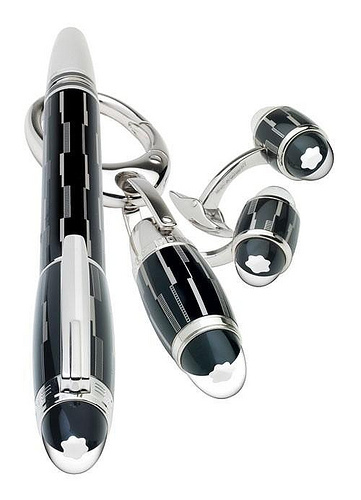 They are also something of a status symbol; if you can afford a Mont Blanc pen, it carries the same cachet as smoking a $150 cigar or owning a Porsche; there is a level of quality appreciation there that borders on the ostentatious, but could equally just be an appreciation of the finer things. I lust after them. I carried a montblanc knockoff that I got in Mexico City for years. I remember vividly the feeling when I was boarding a plane and a man in an aisle seat was writing in his moleskine using a montblanc fountain pen. I found myself estimating my ability to grab the pen and dash up the aisle before he or the attendants could stop me. Good thing we were departing, not arriving. Sometimes impracticality can save you from doing stupid things. I spent more time than I needed to looking at them in the store, their shiny brilliance. Frankly, I spent more time than I needed to looking at the images on Flickr of other pens. I have fine writing instruments of my own – a Cross pen my parents gave me, and a goofy little striped pen with a nice weight that I use at Unconferences. I love looking at fine writing instruments. When we shop, we sometimes act as if we are time-traveling general contractors. We buy components we think we’ll use when we zip back to that dreadful moment in the past to patch things together. Make it all right. Bruno’s idea has been sticking in my mind a lot. He makes the point when talking about his quest to eschew consumerism and live more essentially that our purchases and desires are often driven by less need than want, and not even the “want” that is the designed function of the object of our lust. No, we buy things – or want to buy things – because we are convinced, either by the media or our friends or something in our own minds – that having it will change something. Since I haven’t been inundated with Mont Blanc commercials, nor do I tend to hang out with people who have these kinds of pens, I kind of wonder: what is it about them, and similar instruments, that is so attractive? I have pens; I have really nice pens, and there’s no need to replace them. This is the part where, if I were a good blogger, I’d do the big reveal. I’d tell you exactly how I’d figured it out, how I’d grown from the revelation, and how I could share that knowledge with you in a way that would help you in your journey, too. I have some ideas. I think it has to do with the idea of time to write, and also of a space that supports the idea of having such a pen. I think it has to do with a longing for an environment that wouldn’t lead me to lose it or have it stolen by some airline passenger with less self-restraint than myself. But really, I don’t know. It’s something to keep pondering, though, because learning about the motivations behind the things we want is a much better strategy than simply getting the things we want. Perhaps you feel that the quality of your writing will improve with the quality of the instrument, that magically the words flowing out of that Mont Blanc (swoon!) will be better than those out of the Bic. I feel like my life would just be so organized if I could find that one thing in Staples, or OfficeMax, or the Levenger catalog. But no matter how many binders or InkJoy pens or postits I buy, it just isn’t any more organized than before.